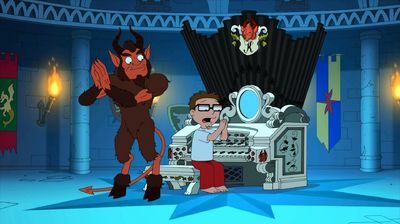 When Steve starts acting like a spoiled brat during the holidays, Stan takes him to see his incarcerated Grandpa Jack, who tells him the story of how he caught Minstrel Krampus (guest voice Glover), a legendary demon who punishes naughty children on Christmas. Stan decides that releasing Krampus is the only way to straighten out Steve's attitude. But when Krampus kidnaps Steve, it's up to Stan and Roger to get him back. Meanwhile, Hayley gets a job at the airport, but quickly realizes that she might not be cut out for customer service.